What I mean is: the present always has a future, even if we can't see it or don't know what it is. It's like a movie, you just started watching the first scene, but the ending has already been filmed. Your plan would be to cut of Rogues finger and see what happens to F-Rogue, but you're ignoring the part where you heal it. You have to know exactly what happened in order to know if anything changed, we don't know if FRogue had his finger cut off and then healed, so we can't know if it's any different from what happened to his present day counterpart. If you cut off Rouges finger and then heal it, then you'll only see the final result on F-Rogue, which is one where he still has all his fingers. You won't see a finger disappear and then comeback once you heal his present self. Edited by Sloth9230, 26 April 2013 - 02:38 PM. Zeref and/or Acnologia possess Dragon Manipulation magic. It does not work on dragons that were originally human. Back on Tenroujima, when Zeref said "Acnologia" the council folks jumped to the conclusion of "Zeref's planning to do something with Acnologia, we better get the hell out of here." Zeref for his part seemed to instead be thinking "Acnologia? I better get the hell out of here." So the council folks seemed to think that Zeref could control Acnologia, but he apparently could not. Fast forward and Zirconis told the tale of a dragon slayer that killed dragons until he became one himself. Right after that Arcadios showed up with a tale of Zeref being responsible for the creation of Acnologia. And Future Rogue shows up with Dragon Manipulation magic but says controlling thousands of dragons is difficult, without specifying whether the problem is power, range, or multitasking. So assuming everyone is at least partially right, let's go back 400 years. Zeref develops Dragon Manipulation magic, because he seems to make all sorts of things and controlling dragons would be a handy thing to have in an age where thousands of dragons are running around and warring. So he gains a reputation for being able to command dragons. But it's limited, he can't simply order thousands of dragons to not eat humans. The moment he turns his back and stops focusing on them, they're on to the next town for dinner in short order. So he comes up with a plan. Make a dragon slayer undisputed ruler of the dragons, and he can end the war in favor of humans. So he finds Acnologia, and grants him power. Or more specifically, near invulnerability like exhibited by Deliora or Hades, with himself being the "devil's heart". If Acnologia turns on him, well he's got dragon manipulation magic to deal with him. So he goes through with the plan using manipulation to force dragons to fight if necessary, and Acnologia turns into a demonic dragon that all dragons fear. Only for Zeref to learn that Acnologia is no longer interested in ending the war in favor of humans. And to Zeref's horror, his manipulation magic does not work on Acnologia because Acnologia was once human. Things vary a lot more at this point as to what happens next. For example Acnologia could demonstrate that he's been paying attention and figured out dragon manipulation magic for himself thus negating Zeref's ability to recruit dragons for back up. Or they could have simply fled in fear of the two. In any case Acnologia starts going after Zeref and/or the other dragons, and the rest of the remaining dragons hide, from either Zeref, Acnologia, or both. Either one can command them, leaving them stuck raising more dragon slayers to put an end to the two threats. It's not such a wild theory, it looks like a great one! That makes a lot of sense and fits pretty well with the story so far. It could explain a lot of things if that's really how it is, and especially Zeref's character who is so different from what tales say. Rogue's mind control will be severed. The 7 dragons will train 7 new dragon slayers. Edited by nosebleed, 01 May 2013 - 01:04 AM. ^ I totally see the first part happening, but not the second one. Why not? Igneel's and Atlas's flames could have different properties or something. Also, we don't know about the other dragons, but Zirconis is no friend to mankind. He found the idea of raising DSs to be foolish. He would not train a DS. Onto random speculation: The power of the GSs originated from the four gods of Ishval. To be serious though I think there could be thousands of Fire Dragon Slayers with no issue, however that would be terrible for the story. Dragon Slayer Magic is a lost art. While that probably was the case during the Dragon Civil War, there shouldn't be as many today. Spoiler The world must have sucked 400 years ago if this was going on. Especially when one wasn't enough to stomach. Well, this doesn't necessarily mean Zeref was a good guy at the time, or always was in the past. It just means that he recognized continued rule of hostile dragons as a threat, and took steps to neutralize it. There's also a bit more to the theory that I didn't have time to more than touch on earlier. Obviously Zeref can't revoke whatever power he gave Acnologia, or he would at least do that. He also sounded pretty suicidal with all the talk about wanting Natsu to break him. But if it's just a matter of wanting to be vaporized, assuming Acnologia's strong enough to do so, it shouldn't matter that it's Acnologia that does it instead of Natsu. Yet Zeref flees from Acnologia. Acnologia for his part seems to be searching for Zeref as his first target, even though Zeref shouldn't be much of a threat to him. So what does Acnologia want? Immortality. Zeref's immortality. As things stand, Acnologia either has the sort of "immortality" Zeref's creations like Deliora have, or his immortality depends on Zeref continuing to live. We know any wizard can use any magic, Acnologia was once a human wizard, and it's possible to learn magic by directly stealing them. So Acnologia wants to take Zeref's immortality for himself and become truly invincible. Natsu killing Zeref would block that. Zeref can trust Natsu not to try and steal his immortality, and when Natsu kills Zeref, at the least, Acnologia is denied invulnerability, at the most, he loses his existing invincibility and becomes vulnerable. Well, there's not a lot of DS, so it would be a shame to have two fire DS tbh. 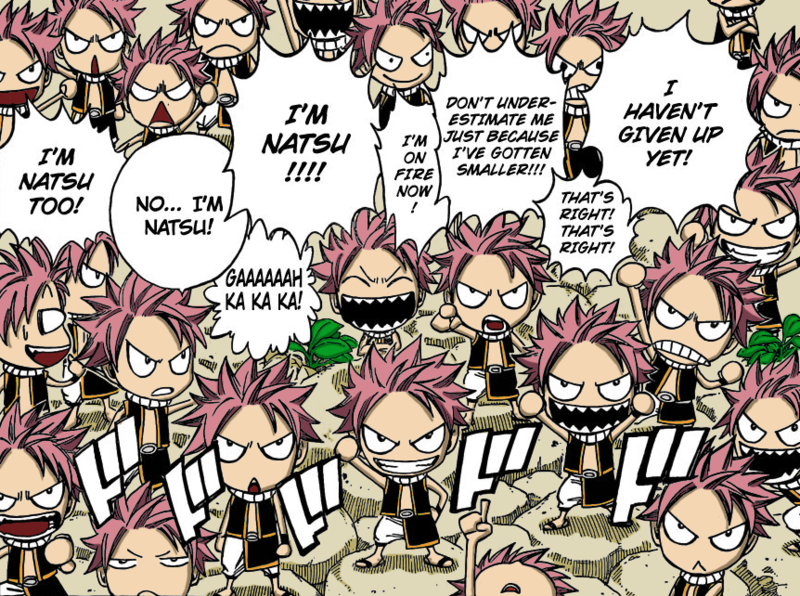 And Natsu gets the best out of fire anyways. Zirconis is not a friend of Acnologia either IIRC. That makes even more sense when you add that. The only thing remaining is how to fit in the fact that Zeref already knows Natsu. In any case, Zeref as an immortal is most probably true. It explains his appearance and goes with the fact he rules over life and death. You probably are right on the spot there. Well, Krono, your theory looks even more possible now. If the dragons can use the same magic as humans and not just dragon magic, it totally legitimates the fact that Acnologia could look for Zeref to steal his immortality. Cobra is joining Blue Pegasus? . Fire Dragon could be Plasma or Magma dragon. Edited by nosebleed, 11 May 2013 - 12:36 PM. Cobra is joining Blue Pegasus? He's much more suited to Crime Sorciere. We shall see. It certainly doesn't hurt the theory. Meanwhile, for another theory: The hundred year quest was requested by Zeref or Mavis. Not much evidence for this one. Just that we know that like ten year quests are so named because that's how long it's taken for someone to complete them, the name "hundred year quest" is likely intended to note that no one has completed it in 100 years. So it would have been originally requested/issued a hundred or more years ago. The only big players that were around back then are Zeref, Mavis, and the council as a body, but probably not any individuals of it. Assuming Mashima plans to make it relevant, it'd be more interesting if the requester was still around. Especially as that would allow them to give additional information to justify the long quest being cleared in short order. Edited by Krono, 16 May 2013 - 08:44 PM. ok in regards to this latest chapter I have some ideas on how natsu can power up, and it wont seem like an utter asspull like always. (usual nakama power thing) Atlas Flame's flames apparently can cancel out magic to some degree and natsu has now eaten those flames. If he really does absorb teh power of the flames he eats wouldnt that mean his flames can now cancel out magic too? Just a thought. Also Igneel=Fire dragon king. Expect natsu to have an upgrade to his move set so it'll something like Fire dragon king mode. Atlas Flame's flamescales did not "cancel out" Laxus's or the Raijinshuu's attacks. They do not function as magic negation. The attacks simply had no effect on him, since they were bad matchups against him. Edited by Phenomiracle, 24 May 2013 - 08:51 PM. actually,didnt he just burn their magic ? ala natsu vs zero ? So, random theory time. Like a number of other people, the latest chapter has me speculating that Ultear might sacrifice her life to save Gray. That's kind of vague though, so I'll clean it up and elaborate it a bit. Way back at the start of this arc, when Ultear offered Natsu's training group Second Origin, the reason she gave for being able to offer it was that her Arc of Time had improved to the point of working on living creatures. Not that surprising considering that the previous arc revealed that her true goal for learning Arc of Time was time travel/turning back time to when she was happy with her mother. So we know it can affect people to some extent. Gray for his part I don't think is dead yet. Mashima said in an interview he does not like resurrecting characters. I'm sure that statement is provoking laughter in some quarters at the moment, but it's true. It's part of the reason why he'll bend over backwards to retcon's someone's death but doesn't do what Kishimoto did in Naruto and have characters flat out resurrected by various means. So moving on a fairly natural theory is that Ultear will use her magic to reverse Gray's wounds at the cost of her life. That would maintain the drama of someone dying, while shifting it away from being Gray doing the dying. People are rather vague about why it would cost her her life, especially seeing as she can affect living creatures now, so here's where I really get to my theory. Lost Magic tends to have some nasty catches to it. Limitations, side effects, etc where if you screw up it does something unpleasant to you. Great Tree Arc: Over extend yourself using it, and you will turn into a tree. Human Subordination: Use it on a non-human, and you lose your body and fuse with them. Even if you manage to separate from them to get back to your original body, you're likely to melt away to nothing at that point. Arc of Embodiment: Rusty Rose assures us it has some restrictions and limitations. Dragon Slayer: Use of it will eventually turn you into a dragon. We don't know about the rest, though presumably there is something just waiting to screw over an incautious user for them as well. Anyways, we don't know what sort of backlash Arc of Time would have, but given the way the others have worked, it'd be pretty logical to guess that it screws up the user's aging. For example, if you attempt to age someone when you are unable to, you yourself end up getting aged to the point of death. Now, Ultear stated that she could now affect living creatures, but that's kind of vague. It's entirely possible that she can't rewind people, she can only fast forward them to a limited extent (so far). Good for carefully speeding up the development of their second origin, not so good for fixing up a person that's been shot up. So, with her Arc of Time not quite up to the task yet, Ultear goes ahead and heals Gray anyways. She succeeds at turning him back to the state just before he was shot up, but as it's something she's not supposed to be able to do yet, it causes deadly side effects to her. Only since she was trying to rewind Gray, instead of Fast Forward him, instead of being aged to the point of death, she's de-aged to the point of birth. End result, Gray's saved, Ultear's effectively killed off in a PG-13 appropriate manner like Azuma and Zoldeo were. Merudy gets an infant Ultear to raise the way Ultear move to raise her, and in a twisted way Ultear gets part of her original wish and goes back to an age when she was happy. Honestly, I'd like seeing Urtear going back to infant age, that would be so funny, and so fitting for Fairy Tail! That gives her a real second chance and all. Gray looks pretty dead, but if it can make your theory works, I'd rather have him still alive. The Ultear turns into an infant, that a is great theory. I kind of hope that happens. And if she is needed again, she can be speedly aged like Sailor Saturn.